In Ferrol, in the province of A Coruña, there is a party that has already been recognised as being of International Tourist Interest. From Palm Sunday to Resurrection Sunday, people go out to see the images of their five confraternities : Angustias, Dolores, Merced, Santo Entierro and Soledad. 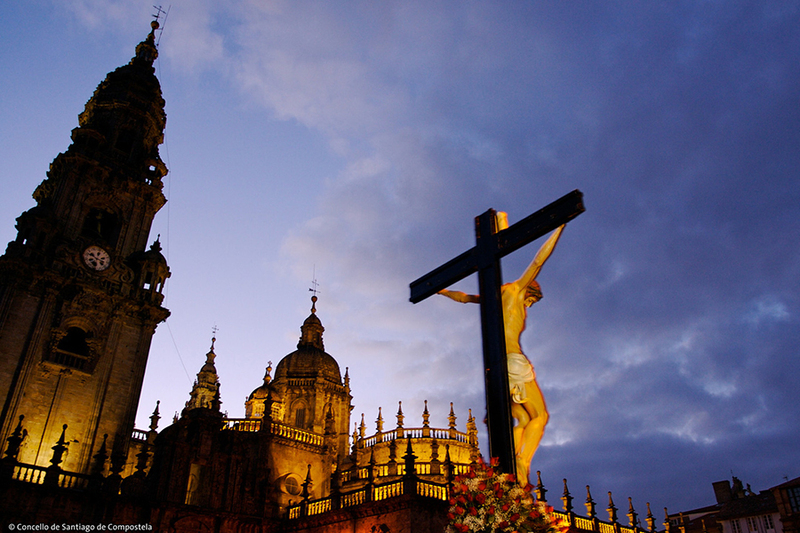 Although the whole festivity is lived with fervor, the processions that go out on Good Friday stand out especially: Santo Encuentro, Santo Entierro and the most overwhelming, the one of the “Caladiños”. A pass that crosses the historic centre of the Magdalena district, with the steps of San Juan, Cruz de Sudario and the Virgen de los Dolores. To finish off, we cannot overlook the procession of the Santísimo Cristo de la Misericordia y María Santísima de la Piedad, in which a total of 1,800 confreres, seven “pasos”, nine bands of music participate, and which culminates with the singing of the military of the Brilat. No more, no less! 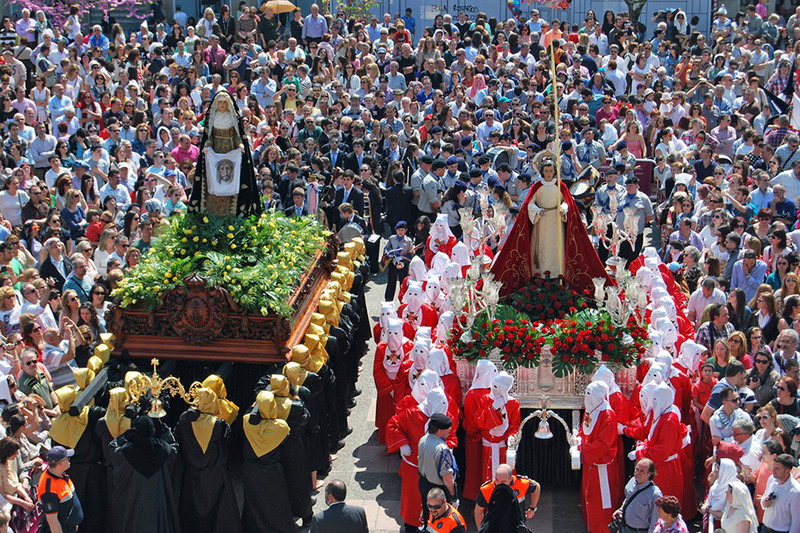 We end with the Easter of Viveiro in the province of Lugo. Declared a Festivity of International Tourist Interest and one of the most recognized in the Galician community, it stands out mainly for its antiquity and its impressive imagery. The processions create an intimate atmosphere in the streets of the town that is sure to overwhelm you. 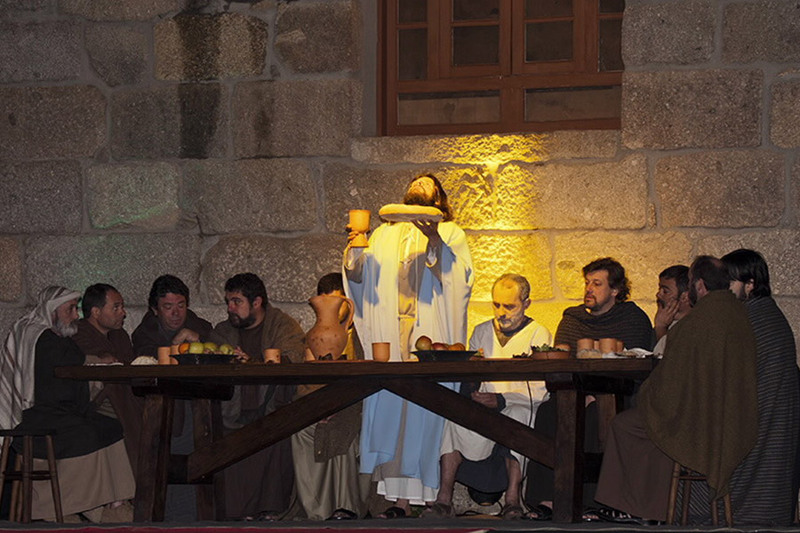 The most striking acts begin on Maundy Thursday with the procession of the Last Supper, with a passage created in 1808 by an artisan and with the Prendimiento, very showy by the tunics and hoods of the brotherhoods. The representation of the falls of Christ, with the cross on his back, the Virgin, the Veronica and Saint John looking for him, is also recommended. 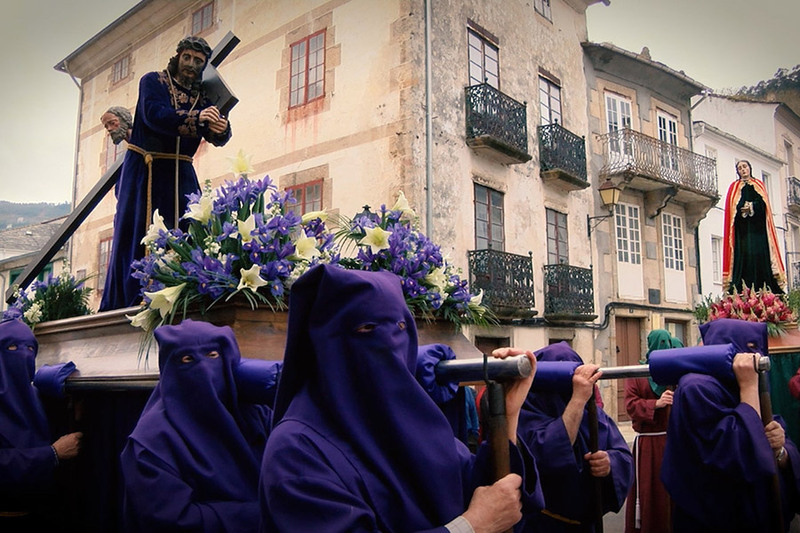 In the municipality of Meis, Pontevedra, they celebrate the so-called Semana Santa de Paradela (Easter of Paradela). For several days, some of the best known passages of the Bible are staged, such as the Passion, Death and Resurrection of Christ. Neighbors become experienced actors every year to delight attendees with a masterful performance in the middle of the street. However, nthe interpretations of the Judgment of Jesus cannot be missed, the flogging, the Calvary and the crucifixion on the Monte da Croa. 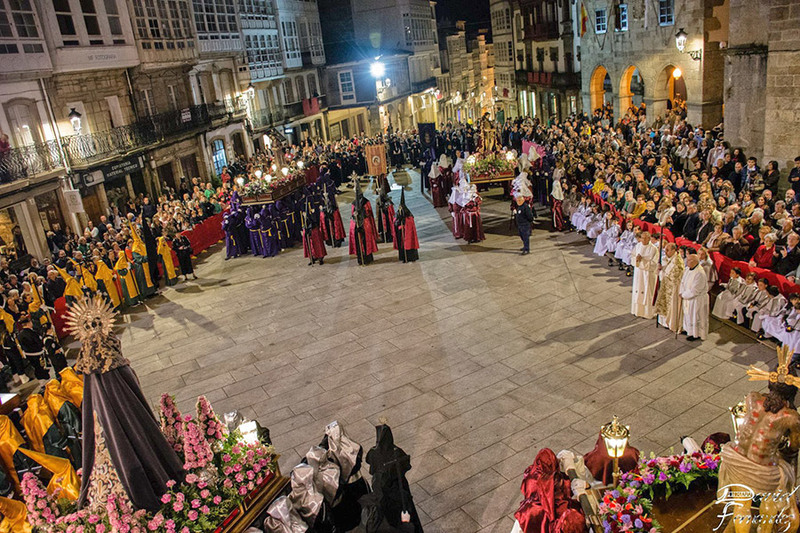 Easter in Mondoñedo, in the province of Lugo, is a tradition that goes beyond our days, as it dates from the sixteenth century. A Festivity of Tourist Interest in Galicia which, moreover, stands out from others for its simplicity and sobriety. The central point of the acts of these days, both liturgical and processional, is the Cathedral of Mondoñedo. From this point, you can see such representative processions as the Santo Entierro or the Soledad on Good Friday. Do not hesitate, because spending a few days surrounded by tradition, history and recollection, is a success. 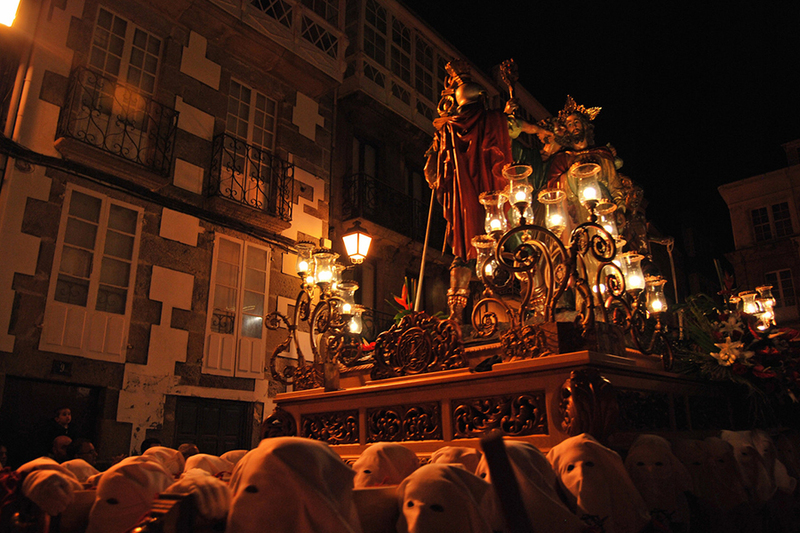 An Easter of Tourist Interest is also celebrated in the municipality of Betanzos in A Coruña. It begins the Friday before Holy Sunday with a mass in honor of the Virgen de los Dolores. From this day on, music becomes a fundamental part of the festivity with the renowned Sacred Music Cycle. The cobblestone streets of the historic centre are filled with music and songs practically from the beginning to the end of Easter. 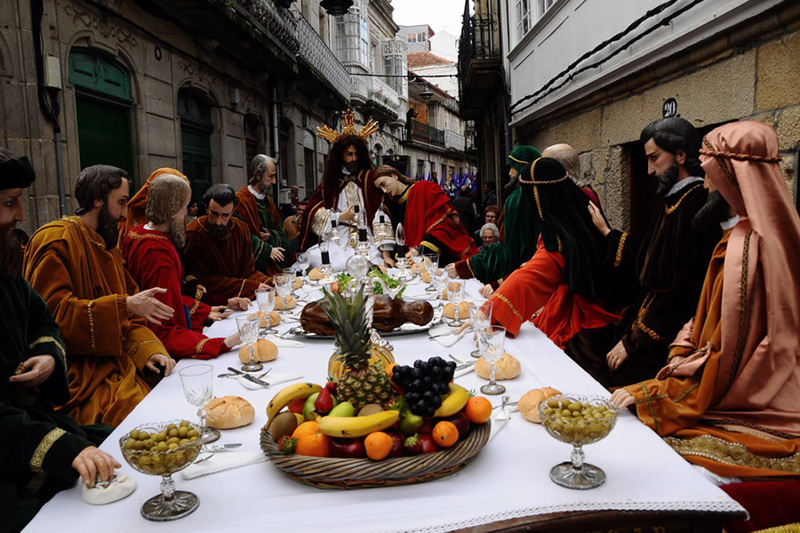 Also of tourist interest in Galicia, the Easter in Cangas (Pontevedra) has “pasos” of important historical and artistic value. What stands out in this case, of its processions, are the images articulated as the Nazarene of the procession of the Santo Encuentro or the Christ of the ceremony of the Descent. Undoubtedly, a show of realism for all those who come to the town at this time. In addition to the processions, the music of the bagpipes and drums that accompany the slow pace of the costaleros, bring emotion and solemnity to the religious encounter. 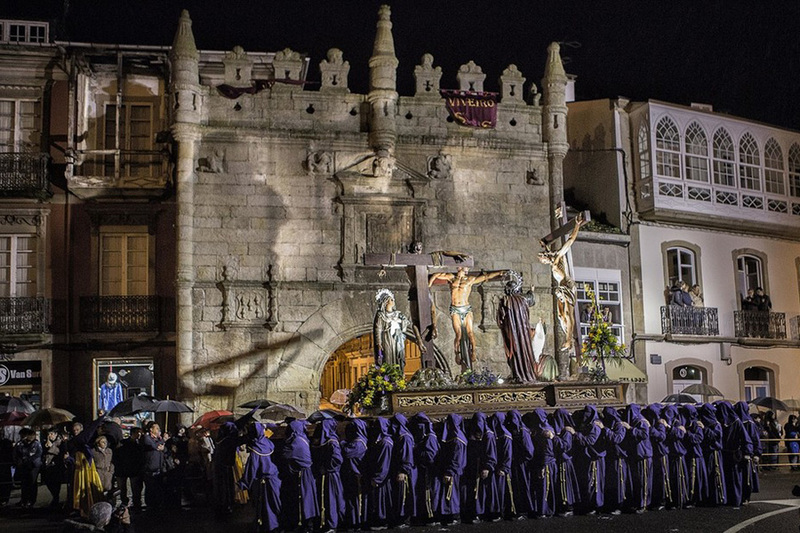 Compostela’s Easter is a celebration of more than seven days of events that include concerts of sacred music, liturgical acts and of course, processions. We must highlight that of Nuestro Padre Jesús Flagelado, popularly known as ‘Caladiños Descalzos’ (Barefoot “Caladiños”), as the confreres procession with heavy crosses and long chains that drag with their bare feet. This accentuates, if possible, the drama of this tradition. However, it is not superfluous to know that the procession of the Most Holy Christ of Mercy or of the ‘Students’ also enjoys great popularity. 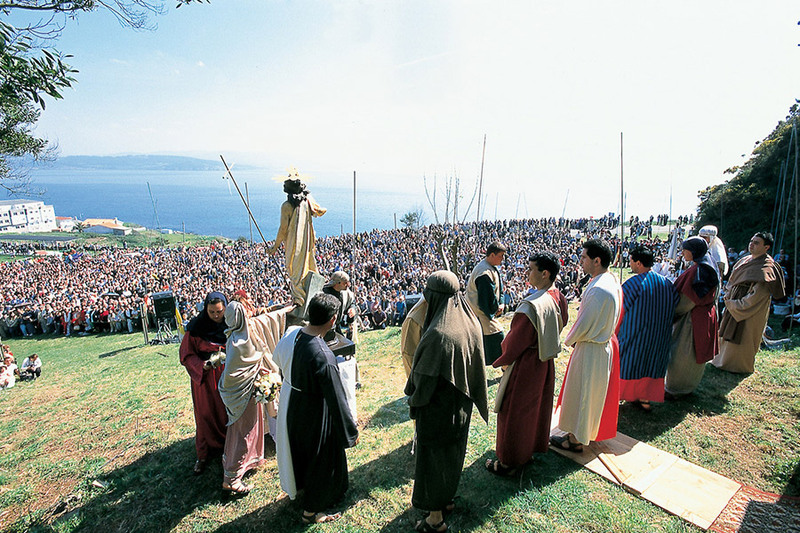 In the vicinity of the church of Santa María das Areas, Fisterra lives its Easter with special fervor. A feast of Tourist Interest that you will surely remember for the stagings of the Passion of Christ by the neighbors, the Gospel passage of the resurrection of Jesus and of course, the atmosphere that is created with the thousands of attendees to the feast. In addition to the songs, the music of the band, the noise of the rockets and the ‘Danza da Nosa Señora das Areas’ which has been danced since the 17th century at this time. Need more reasons? 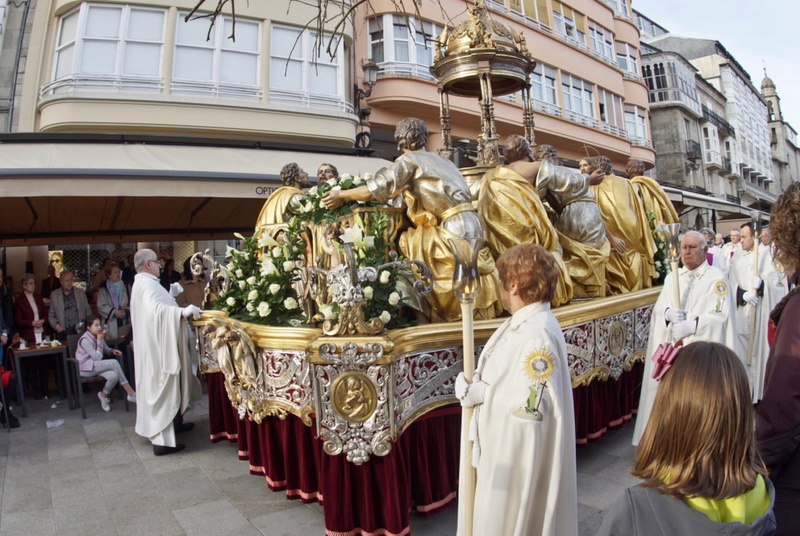 The Easter of Lugo is celebrated this year with the recognition of festival of tourist interest with several outstanding elements such as the history of their brotherhoods, the artistic value of their images, the presence of public of different ages or the fact that they are involved in part of their acts various institutions. In addition, from the religious point of view, it is singular to include Holy Thursday, in the Procesión da Cea or the Sagrario da Reserva. This fact gives the Easter of Lugo a unique characteristic for believers. Other activities such as concerts and archaeological visits are also organised. Feel free to discover for yourself the emotion that is experienced in each one of them!